Final reminder and last call – This is ALMOST full. We can take 200 or so and we have 160 registered. Dr Phinney is the medical and scientific guru of low carb nutrition. Right here in Auckland this Thursday evening. Don’t miss out. Details below. Dr Steve Phiney, the LCHF guru, will be visiting our research centre and doing a public presentation on the evening of Thursday August 28th. We will focus the session on both health AND sport and endurance performance. Places will be limited to 100 – please register your interest with us by email hcentrem@aut.ac.nz with “Steve Phiney rego” in the subject line. We are going to ask for $5-10 donations on the night to help cover costs. 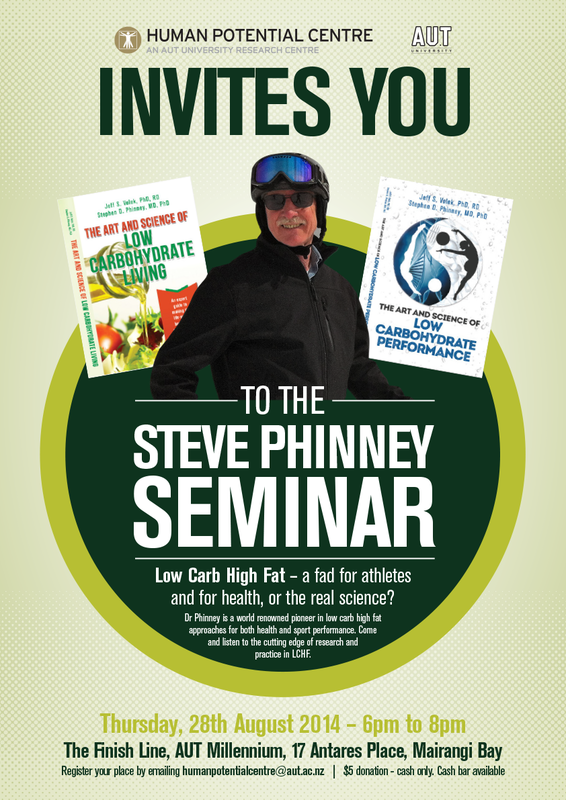 Dr Phiney is the co-author of best sellers and highly useful books — The art and science of low carbohydrate living, and the Art and science of low carbohydrate performance – click here for more.